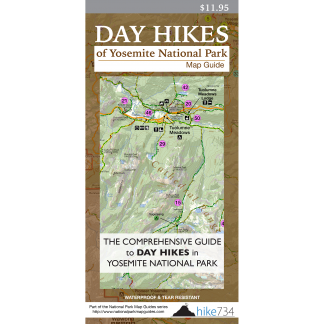 This hike to Stanford Point also visits Dewey Point and Crocker Point along the way; each with it’s own wonderful vantage of the Yosemite Valley. The trail drops through a nice forest on the way to flower-filled McGurk Meadows and the historic cabin. Past the meadows, the trail travels through more forest to reach the Pohono Trail. Head west (left) at the junction. The trail travels over numerous ridges through the varying forest and crosses seasonal streams before climbing up on the ridge that takes you out to Dewey Point, a rock outcropping looking thousands of feet down sheer faces to the valley below (see Dewey Point). The trail loses elevation as it continues along the rim. The trail descends into the trees before dropping fairly steeply to the outcropping that is Crocker Point. 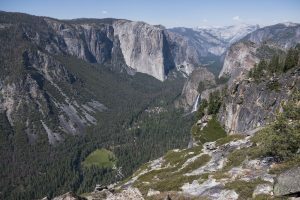 This vantage primarily looks east and offers a great look at Bridalveil Fall far below you. From Crocker Point, continue another 0.5mi/0.8km down through the trees, across a creek, and out to Stanford Point. While the view of the valley is more aesthetically pleasing from Crocker Point, Stanford Point is framed better in a camera. Turn around here to head back to the trailhead. Alternatively, further down the Pohono Trail is Inspiration Point (see Pohono Trail). Trailhead: The trail starts at the signed McGurk Meadow trailhead on the Glacier Point Road. Parking is along the road to the east.